From studying under the streetlights to CEO of a US firm! It is also the story of how Kalyana Raman Srinivasan, who was so indigent that he had to study under a streetlight, but then managed to score excellent marks, rose in life and became today’s Kal Raman. At every turn in his life, he took the difficult path and it turned out to be the right one and in the right direction. His rise to the top is more dramatic than a thriller. 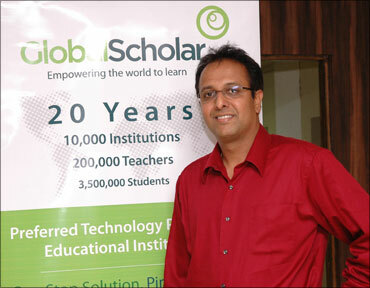 Today, he is a very successful entrepreneur and the founder-CEO of GlobalScholar. Read his extraordinary story of triumph and determination . . .
Kal Raman was born and brought up in a small village called Mannarakoil in Tirunelveli district of Tamil Nadu. It was a comfortable normal middle class life for him and his siblings as his father was a Tahasildar there. But the sudden death of his father at the age of 45 changed everything overnight. He didn’t know why he used to tell his mother, “One day I will give you so much money that you will not know what to do with it!” Years later, he did exactly that! Kal Raman believes that God played a hand in all the major turning points in his life. The first turning point in life was after his 12th standard. He got good marks in both the engineering and medicine entrance exams, and for engineering, he got admission at the Anna University in Chennai while for medicine, it was in the Tirunelveli Medical College. So, he stepped into a new world outside Tirunelveli, and that was Chennai. Though he had got merit scholarship and a lot of good people helped him pay the initial fee, the scholarship amount never used to reach him regularly or on time. Like opting for Chennai and joining Anna University instead of a college in Tirunelveli, Kal Raman took another risk with his first job also. His first job was with Tata Consulting Engineers (TCE), and he had a choice of joining either Chennai or Mumbai. Although he knew nobody in Mumbai, he chose the capital of Maharashtra. So distressed was the manager to hear Kal speak that he immediately released a month’s salary in advance and also arranged for him to be at his friend’s place till he could find a place to stay. Kal’s rise in career was meteoric in a short span of time. Within a month, he got a chance to move to Bengaluru (then Bangalore) and also to programming. Soon, he was in Chennai with Tata Consultancy Services (TCS). Within a few months, he was sent to Edinburgh, UK. From Edinburgh, his next stop was the United States. In 1992, he went to the US as an entry level contractor with Wal-Mart. In two years, he was a director running a division. When he left Wal-Mart after six years, he was a man running the information systems for the International Division of the retail giant. In 1998, he joined drugstore.com Online Pharmacy as the chief information officer and in 2001 at the age of 30, he was the CEO of the company. He was at the right place at the right time. “God was there at every step guiding me to take the right decisions. I was also willing to take risks and tread new paths,” Kal says. 4 Responses to From studying under the streetlights to CEO of a US firm! Patience is required isn’t it. And belief of course, along with hard work, courage and tenacity. Great this is Hari. This shows that man/woman must not think that life has ended with a calamity like Kal’s father’s untimely death. It only triggered the hard worker and hero in Kal. Thanks for bringing this story to our attention. Keep the good work going Hari! Usually i feel unlucky. Now i get boost.